Upon the spontaneous invitation of a friend who saw my Vigan posts on Facebook, I hopped on a bus to her hometown of Badoc, a little over an hour north of the World Heritage city. Being the southernmost town of Ilocos Norte, Badoc is the gateway to the province; however, most travelers bypass it and head straight to the tourist hotspots further north, such as Laoag, Paoay and Pagudpud. So I was curious to find out what this unassuming town had to offer. Soon enough, I realized that the town’s historical importance, pilgrimage sites and untapped natural attractions make it a memorable stop in an Ilocos tour. 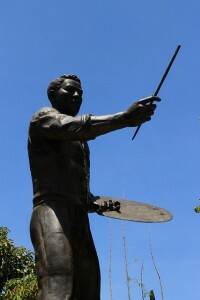 First and foremost, the town of Badoc is the birthplace of an illustrious master: Juan Luna, a 19th century Filipino painter, sculptor and a political activist of the Philippine Revolution. His family’s home, which burned down in 1861, was restored in 1977 by First Lady Imelda Marcos. The Juan Luna Shrine houses mostly reproductions of Luna’s work; and some antiques, including an original “emperor-sized” four-poster bed used by Luna himself that’s over 120 years old. Another important site is the Badoc Church (St. John the Baptist Parish Church), whose facade has been gaudily painted in white and blue. The impressive belfry and buttresses, however, were spared, retaining their old world appeal. Aside from being the place where Juan Luna was baptized, this Spanish colonial church houses La Virgen Milagrosa de Badoc, a 400-year-old image of the Virgin Mary found by fishermen in the 17th century. As the story goes, in the year 1620, fishermen found the image of the Virgin together with Santo Cristo Milagroso – a statue of the crucified Jesus Christ; two statuettes of angels and a violin in a large wooden box that was washed ashore in a village located between the towns of Badoc and Sinait (in Ilocos Sur). It is believed that the box came all the way from Nagasaki, Japan during a time when Christians were persecuted by feudal warlords. It is said that the people of Sinait were unable to carry the image of the Virgin to their town; and the people of Badoc were unable to do so as well with the image of Christ. When they exchanged the holy images, they were miraculously able to carry each to their respective towns, indicating that the sacred statues chose their new home. Saud Sand Dunes – the humble town of Badoc also has them! Another surprising discovery, unknown to the tourism circuit, are the Saud Sand Dunes, similar to the touristy ones found in Paoay, where sandboarding and 4X4 rides are popular activities. Exploring the sand dunes is best done in the late afternoon, when the dunes cast dramatic shadows across the landscape. Besides the sand dunes, there’s more to discover for the intrepid visitor. Not far away, there are the coral rock formations, tidal flats and gray-sand beaches of Pagsanahan; and offshore, the uninhabited island of Badoc, which offers a nice place for swimming and snorkeling. HOW TO GET THERE: From Manila, ride a Partas or Florida bus bound for Laoag, and alight at the “Badoc Detachment” bus stop (9 hours). From here, tricycles can take you around town. nice to see this juan luna shrine. i wasnt able to drop by here when i went there. been very interested to know about this place of luna since knowing about his “The Parisian Life painting’ w/c GSIS bought for P46 million currently valued to P200M or $8k in an international auction just not to let this piece of heritage be taken away from us. i wish u should have photos of the inside or what else can we see inside? Wow, I’ve learned three facts today. 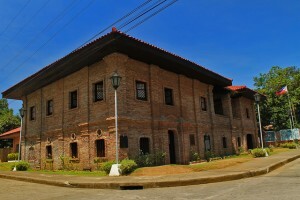 One is the birthplace of Juan Luna. Second, the painting bought by GSIS. And lastly, he killed his wife and mother in law. Thanks for sharing those historical facts, Maria!